Le Cordon Bleu sees Kuala Lumpur, with its vibrant food scene and forward-looking cuisine, as an important location for its newest school. It represents the French “Art de Vivre” in a large multicultural city with abundant fresh produce, great history and a confident future. The set-up of the Sunway Le Cordon Bleu Institute in Bandar Sunway with its “Resort Living within the City” concept provides a comfortable and conducive learning and living environment in the self-contained township. With some of the best restaurants, café and famed street food centres in the vicinity you are never far from the uniquely Malaysian experience outside your kitchen experience. Le Cordon Bleu, now here in Malaysia, has been synonymous with culinary excellence and will definitely raise the bar in culinary arts education in Malaysia and South East Asia. At Le Cordon Bleu Malaysia, you are taught by our team of classically trained chefs who have experience working in the finest restaurants and hotels in the world. Being in Le Cordon Bleu allowed me to dig deeper into what I thought was soft passion had became my proffesion and lifestyle. I learned and explored the French way of cooking whilst at school. It also made me a wholesome person being able to share what I had learned from Le Cordon Bleu. As the first Ambassador of Le Cordon Bleu Malaysia, it means shouting out loud to the world that "Look, I’m a Le Cordon Bleu graduate". To master the techniques, innovate and present a good cake, you need to learn from Le Cordon Bleu master chef instructors. Most importantly, being an ambassador also means to be able to represent the brand both in words and actions. It's really a great feeling when passion bind together with studies. You will definitely love what you're doing. 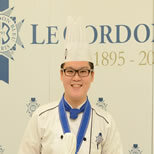 Moreover, Le Cordon Bleu Malaysia has given me the best teachers and its wonderful cooking techniques, in which I believed it couldn't be obtained anywhere else. 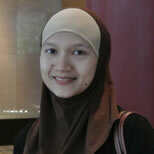 And what I have to do is just put all my effort on it. Being Le Cordon Bleu's alumni is such a wonderful thing. I can proudly say that I am from Le Cordon Bleu and it's a "wow" factor there. 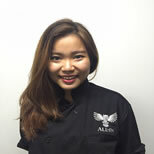 After graduating, I got a chance to work in Bali, Indonesia as a commis and got promoted as a production controller in only 5 months shortly after I started working! 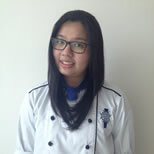 I would like to say, "Thank you Le Cordon Bleu !" 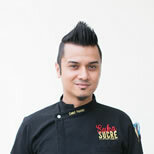 Having studied for cuisine Le Cordon Bleu Malaysia, I realized that as long as I have the passion and genuine love for preparing good food and creating joyful ambience where people can get together and eat, these emotions would shine through any of my food preparation, be it sweet or savoury. I have never regretted my decision to change my career and I now know that I had made the best choice when I selected Le Cordon Bleu to be the partner in my new endeavour. After joining Le Cordon Bleu there is no looking for me in the food industry. Thanks to professional guidance of Chef Rodolphe and Chef David - Chef instructors of Le Cordon Bleu Malaysia, I was able to refine my cooking techniques and that gave me a great head star into the working world as a chef. This is because Le Cordon Bleu does not only retain its classical cooking techniques but also introduces students to cutting edge culinary techniques that are used in the industry today. 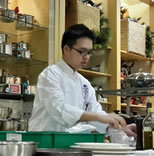 For that, I am proud to be a part of the Le Cordon Bleu alumni. We encourage you to schedule a tour of the school so that you can experience Le Cordon Bleu Malaysia! Upon your arrival here, we will bring you to visit the school facilities so you can discover our state-of-the-art teaching facilities as well as observing how the classes were carried out. Have you ever dreamt of whipping up delightful choux pastries all by yourself or indulge your loved ones with a simple dish of Monkfish Mouclade La Mouclade? It is all possible. That dream is not too far away. Just as long as you have the passion and immense love for food, you can apply to Le Cordon Bleu Malaysia scholarship. Le Cordon Bleu Malaysia offers scholarship annually to deserving applicants who has the most passion for food and cooking.The applicants can be International and Malaysian students, depending on the category.